Jalapeño cheddar cornbread drop biscuits are an easy, cheesy homemade cornbread that’s made from scratch in less than an hour. This cornbread is made with sour cream and milk, and flavored with spicy jalapeños and grated sharp cheddar cheese. Plus, it’s low carb. One of my favorite things about cornbread is its unique texture, which is only made more appetizing when it’s combined with cheese. And jalapeños. And topped with more cheese. (We can never have enough cheese, right? 😍🧀) Plus, cornbread is super quick and easy to make, even when you’re in a hurry. These jalapeño cheddar cornbread drop biscuits can be on the table in less than an hour, which makes them a handy bread to serve with supper. I know, I might be stretching the definition of biscuit, because this cornbread looks more like a cookie than a biscuit. Hey, they’re not sweet, so how could I call them a cookie? 😊 Besides, you can still spread them with butter just like a regular biscuit. If you’re really wanting to take things up a notch, make a sandwich with two cornbread drop biscuits. If you’re a cheese or jalapeño fan, you need to make this recipe in the near future. Cheese makes every meal better! Looking for more quick bread recipes? Check out these other yummy recipes your family will love. Skillet Cornbread: this crumbly, slightly sweet cornbread is super simple to make. 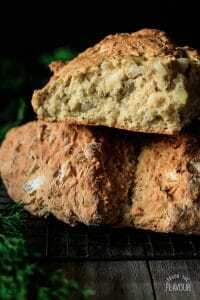 Oregano Onion Soda Bread: there’s no yeast in this tasty loaf of Irish bread. Fluffy Buttermilk Biscuits: this recipe will help you make fluffy biscuits from scratch. Preheat the oven to 400 F. Line two large cookie sheets with parchment paper and set aside. Stir together the cornmeal, all-purpose flour, sugar, baking powder, salt, and paprika in a medium bowl. Cube the butter and rub it into the dry ingredients by pinching the cubes of butter until the mixture resembles fine breadcrumbs. Stir in 1 1/3 cups (150g) of the grated cheddar cheese and all of the diced pickled jalapeños. Pour in the sour cream, then trickle in the milk a little at a time, mixing until a stiff dough forms. Drop the mixture by rounded tablespoonfuls onto the prepared cookie sheets, spacing them 3 inches apart. Sprinkle the tops of the biscuits with the reserved 1/3 cup (38g) of grated cheddar. Bake at 400 F for about 10-13 minutes, until the bases are well browned and the tops are set. Let the drop biscuits cool on a wire rack for 5 minutes before serving.